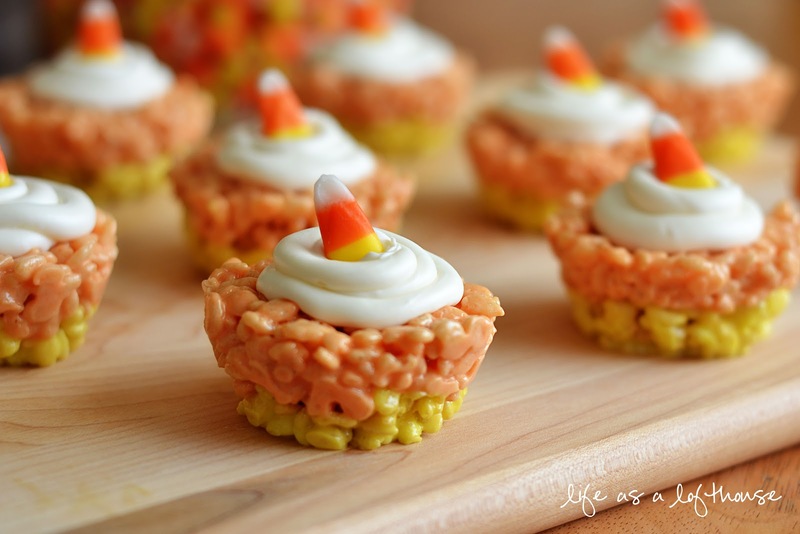 On Saturday I was deciding on a dessert to take to our families Halloween party, and dreamed up these Candy Corn Rice Krispie Cupcakes! I haven’t met a kid who doesn’t like a Rice Krispie treat, and thought turning some into ‘cupcakes’ that look like Candy Corn would be super cute! They were really easy to make (regardless of the long instructions. Promise!) and they were really yummy! 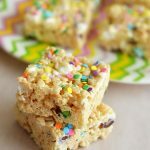 I love Rice Krispie treats that keep a chewy texture, and these fit the bill! Needless to say, they were a big hit at the party. Everyone loved them! Directions: Spray two 12-cup regular muffin tins with non-stick spray. Set aside. In a large saucepan, over medium heat, melt a half stick (1/4 cup) of butter. When butter is almost completely melted, add in 8 ounces (half bag) of the mini marshmallows. Stir constantly until marshmallows start to melt. Squeeze in 3-4 drops of yellow food dye (more or less, depending on how dark a yellow you want). Stir well to combine color into melted marshmallows. Remove from heat. 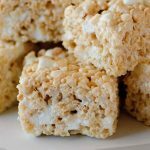 Pour 3 cups of the crispy rice cereal into the yellow marshmallow mixture, quickly but gently stir to combine. Add about 2-3 Tablespoons of yellow rice krispie mixture into each of the muffin cups. Let stand for a minute or two to slightly cool, and then using the back of a spoon, press the mixture into the bottom of the cups. Repeat with all 24 muffin cups. Then set aside. In another large saucepan, over medium heat, melt the remaining butter (1/2 cup). Once butter is almost melted, pour in 1 (16 ounce) bag of marshmallows into the melted butter. Stir constantly until marshmallows are just about melted, and then squeeze in 3-4 drops of orange food dye. Stir well to combine color into melted marshmallows. Remove from heat. Pour in 6 cups of the crispy rice cereal into the orange marshmallow mixture, and quickly but gently stir to combine. Meanwhile, pour the container of vanilla frosting into a medium bowl. Add in the cup of powdered sugar, and using a whisk, whisk together until all combined. Scoop frosting mixture into a decorating bag fitted with a tip of your choice (or you can use a sandwich baggie and cut off one side). Gently remove each rice krispie cupcake from the pans. (They should come out very easy). 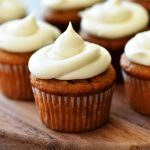 Pipe frosting onto each cupcake and decorate each with a candy corn. These are super cute. 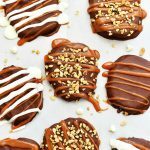 I may have to make them for my office Halloween party! We both have krispies on the brain! These are so adorable! Perfect halloween party food! How fantastic that you have the 2 different colored Krispies! These could not be cuter. Such a fun idea, Holly! Love these. Going to try them for the family on Halloween. Thanks! These are so fun! Perfect for a Halloween party! 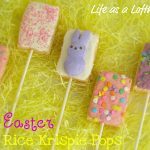 These are adorable, and I just LOVE homemade rice krispies, yummy! Super Duper Adorable! 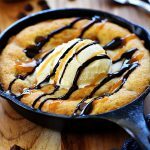 You are one smart cookie…and, krispie too! Very nice creation Holly! Seriously? These are absolutely adorable!! These are just too cute Holly! Love them! These are so adorable!! 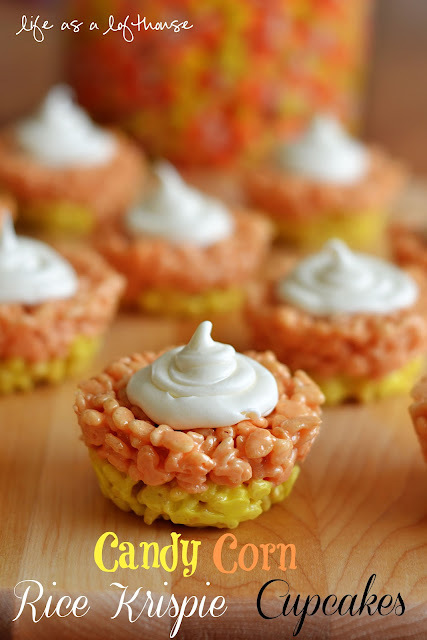 Everyone loves rice crispy treats and I love that they look like candy corn!